What do we know is certain? We all have a deep desire for certainty. People search in different areas of life just to find out something for sure. As you look at God’s design for our lives, true certainty comes from only one thing. Hebrews 11:1, the Bible defines faith as being sure of what we hope for and certain of what we do not see. Isn’t it amazing that the one thing God told us we can be certain of, an eternal life through Christ, is something we can’t physically hear, see, or touch? What we do have is a promise in His Word. Authentic believers live this life certain of one thing: we can overcome this world through Christ believing that our eternity comes from knowing Him. 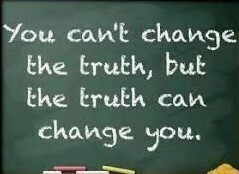 Why not today devote your life to the truth. Though we cannot truly predict what the next hour will bring, we know the One who holds the future. His name is Jesus Christ. The more we trust that, the more it will be evident in everything we do. When it's true in our hearts, our actions can't help but begin to follow. Jesus tells us the greatest commandments are to love God and to love others (Mark 12:29-31). From this day forward, declare to live your life with these commandments at the top of the list as you become the authentic follower of Christ. Dear Lord, we thank You that You are the truth. Help us to devote our life to You completely starting today. In the Name of Jesus, Amen. Your harvest depends on how much you sow. Your harvest depends on whether you sow. Are you listening to God's voice?